Knowledge Base » Installation » How to enable theme updates? Updating the theme will override the old files and replace them with the new ones. So, before you update the theme: if you’ve made any modification to the theme itself (to the files), remember to do that on a child theme so you won’t loose any changes when updating the theme. (You won’t loose any of your content and settings by updating the theme). 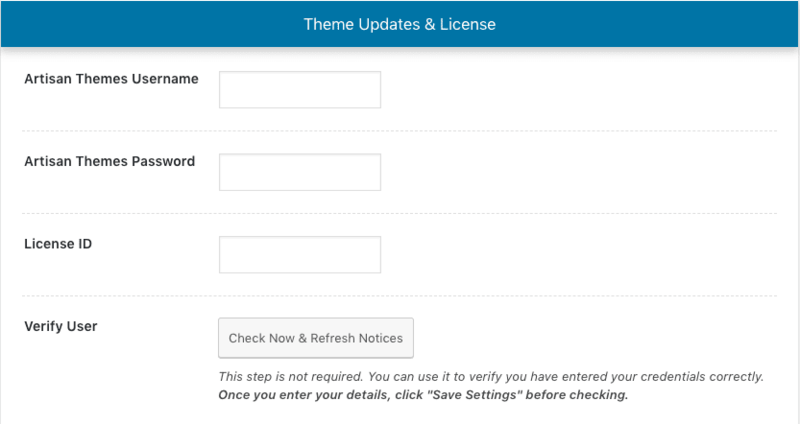 To connect your theme with your license and start getting theme update notifications, fill in your Artisan Themes Username, Password and License ID in the Theme Updates & License section of your theme by navigating to Theme Options » General tab. Then, make sure everything’s properly setup by clicking on the Check Now & Refresh Notices button. That’s it! From now on, you will see any available version of the theme next to your other available plugin updates. So, go ahead and keep your Artisan theme up to date! Note: If your keep getting a message saying that your password is not correct, try reseting your password here. Some servers doesn’t play nice with long auto-generated passwords like the ones our system generates when your user is created, and generally using a password you set by yourself fixes this up.